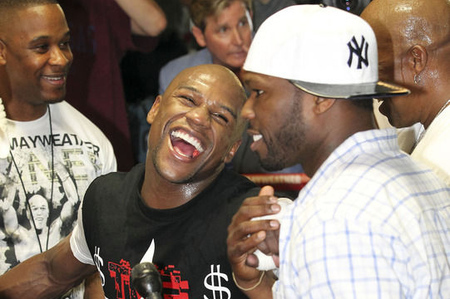 I believe nothing I read about any possible Manny Pacquiao vs. Floyd Mayweather Jr fight happening. My reasons are simple enough and probably no different from most everyone else’s. Quite simply, we’ve been here before. Multiple times over the last several years a fight between the top two fighters on the imaginary pound-for-pound list has been dangled over our collective heads. Then just as soon as everyone was good and riled up at the possibility, it was unceremoniously yanked away. I want the fight to happen, but my days of yearning for it are gone. I put a lot of metaphorical energy into what turned out to be nothing more than another excuse not to face each other. So I turned any attention away from the super ultra mega fight and towards good fights being made and actually happening now. Just as soon as I thought I was out, they pulled me back in. According to Bob Arum of Top Rank (who spoke with BoxingScene.com/Manila Standard), the fight will happen next year. It would take place in April to be exact. The reason I give this a smidgen more credence than any of the other times the fight has been rumored to go, Bob Arum is the one sounding optimistic. All along it’s been Arum against Golden Boy Promotions (GBP), Arum against Floyd Mayweather Jr, Arum against anyone and everyone that seemed to be for the fight. Another reason I feel positive about the fight going down is Arum won’t be in negotiations with GBP, but with Curtis “50 Cent” Jackson’s new TMT Promotions. The new promotional company headed by Floyd Mayweather’s good friend, 50 Cent, has no bad blood with Bob Arum and Top Rank. The fact that any new negotiations begin fresh and with no brick wall already in place before they begin, they just may have a chance of coming to fruition. Let’s just say if I put a percentage a week ago on the fight happening, I’d of said 10%. Today? I’ll give it an “I’m feeling optimistic” 75% chance. Hell, Floyd even said something nice about Manny. That has to mean something, right? !